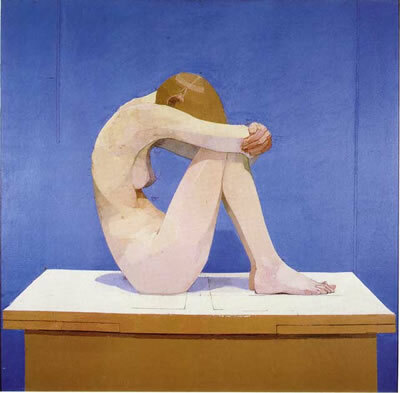 Summer Picture (1971-2) by Euan Uglow,oil on canvas 43 x 43.5"
I can hear the chimes from my neighbors' yards, restful clings that sway in and out of placid tones. Ian and I moved in four weeks ago. A hidden neighborhood in Loveland, Colorado that is cradled by old trees and straight-away views of Rocky Mountain National Park, and a lake reaches out to all of the homes, green waves clapping our arrival. There is enough distance between houses to quantify space and defy the typical suburb, yet we are close enough to have neighbors. They laugh and drink beer on weekends as spring staggers on her decision of snow or sunshine, and people push her toward the sunshine by watering lawns, planting flowers, laying rock, and starting up the grills. They are receiving her and inviting her, like they have invited me. But like spring, I am wavering and not sure if I want to come in. I am not sure that I want such closeness with neighbors. I met Dana shortly after I had bought a 1914 Bungalow in Denver ten years ago. Brick houses to match the urban asphalt and city traffic and neighborhood pubs and pasta joints and oyster bars. Dana lived next door, my house a mimic of hers, of all of the other houses that laid nicely down the street, porches sinking from truck traffic in front of our homes, and green lawns that gave us a fraction of pastoral life. At the time, she was married to an Iowa hick who craved the craft of rock carving along with an abundance of beer. Dana told me they married three months after their blind date four years before. She floated behind him, caved in to his carnivore diet after years of vegetarian meals, and brief laughter drifted out of her whenever he told her she was fat, and she glanced at me when he did this as if she could take it. The first day I met her, she pushed a lawn mower over her front yard, her stout, soccer legs digging in for strength, black soccer shorts hanging limply, and her large tummy and breasts covered by an old, white, cotton t-shirt, arms round and flabby but strong. Her weekend get-up. Always plenty of yard work, she moved dirt and planted newborn flowers, and a large, clay sun, complete with face, hung on her fence to greet her. Dana used to give me things. Packets of beans made by an organization that gave the profits to battered women's groups. Scented candles that came from the homeopathic shop down the street from our homes. She went to Hawaii and brought back a miniscule frog made of stone. The frog sits in my bathroom, in my house with Ian, on a brushed brass four-inch pedestal that holds black and rust-colored stones, and one stone that is carved with the silhouette of an elephant, the symbol of longevity and remover of obstacles. Dana introduced me to "healing" stones when she took me to the neighborhood shop that bulged with taro cards, crystals, chimes, holistic books, healing ribbons, and plenty of healing stones. Years later, I would give her two stones-both fit in her palm, they were smooth and grey, one carved with "strength" the other with "hope." When my new neighbors, Steve and Miriam present Ian and me with a loaf of homemade banana bread, I think of Dana. She would randomly bring over something she made-mostly breads and cookies. She baked holiday cookies, so did I, and we exchanged every year. We also exchanged holiday gifts. We would leave them on each other's front porch in a gift bag, usually a present for us, and something for our dogs. Gradually Dana's husband spent more time at the bar than at home, and she told him to leave. He had basically left already, many nights disappearing, taking his clothes bit by bit, Dana sitting on her back porch alone, periodically yanking out dandelions from the grass. She told me that her mother had said, "Who says a dandelion is a weed? To some it may be just a nice yellow flower." Dana and I had dogs that were two weeks apart. Hers a black lab, Betty, and mine a weimaraner named Finbar. A year after I had moved in, she picked up her puppy from an acquaintance, I picked up mine from an ad in the newspaper that Dana had clipped for me, knowing that I had been looking for that particular breed. When the dogs were four months old, we took them to city lakes, mostly at night so we could let them run off the leash, bopping in goofy strides. Dana suggested we enroll the puppies in the same obedience course. So every Thursday night for eight weeks, Dana used a house key I left for her in my mailbox, picked up Finbar, loaded the dogs into her Ford Expedition, and met me out south at the trainer's just down the way from where I worked. That's the first time I noticed Dana's competitive side. An opposition of one awkward puppy against the other, only I laughed and Dana concentrated. I could see her frustration when Betty wouldn't heal properly, Dana giving her the gentle tug with the leash, her face stuck in consternation. After each session, Dana handed over my key, we walked out together and drove home, following one another in our cars, walked to our front doors together, discussing how the seventy-something-year-old trainer yelled at people when they failed to give stern commands. The last week of class, the trainer informed us there would be a formal challenge between the puppies, and a first, second, and third prize would be distributed. The 30 owners with their 30 puppies, Dana and I included, led our dogs around a course in the warehouse on the cement floor, going through the various drills we had learned. Sit, heal, stay, come. The dogs also had to lie calmly as the trainer's assistant moved a wheelchair passed, abruptly opened umbrellas near the dogs, and clanked pots and pans together. Finally, the announcements came. A chocolate lab came in first, a boxer second, and my goofy Finbar third. I laughed as I led her to her winner's spot and the trainer handed over a certificate, ribbon, and shook my hand. When I turned to leave, Dana was gone. I drove home and knocked on her door. She answered, her face stern, her arms crossed, and she never came outside. "Okay, well, I just need to get my house key." "Oh, right, just a minute." She disappeared into the house and my confusion prompted me to feel the waters. When she returned, I laughed a bit. "Pretty funny about Finbar getting third place." "Yeah, well, I'd like to see what they based it on." I was taken aback by this, and even though Dana and I were close friends at that point, I have this natural impulse to stand my ground whenever people bring down their petulance on me. "I have the score card if you'd like to see it." Dana grabbed it out of my hand. She scrutinized the sheet, looking over each obedience category and checking Finbar's scores. "I just don't think it was fair. I don't see how they judged everything." I understood that it was an argument not worth pursuing. I saw a sample of irrationality forming, seeping from Dana's normal state of pleasantness, and I did not want to shake up a neighbor relationship because of dog obedience discrepancies. "It's no big deal," I assured her, and we said goodnight. Dana did not speak to me for three days. Finbar is ten years old now. Her silver grey hair is turning to white grey. My puppy that at four months had been emaciated, anemic, neglected from her original keeper, had worms, bacteria and yeast infections, kennel cough, and that had sat in my lap within the first five minutes of meeting her, stuffed porcupine in her mouth, plopping in a curl-she will die within a few years. She misses Betty. Before I sold my house in Denver , Finbar looked for Betty through the fence. They used to pass toys beneath. When Dana and I came home from work, she would toss Finbar's green tennis ball back over, and I would toss Betty's plastic Mallard duck back over. I look at my yard. There are many immature trees the previous owner planted. Flowering plum blossoms, aspen, a weeping willow. I realize there will not be many leaves to rake in autumn. Dana and I had a ritual. Each fall, we raked leaves, bagged leaves, loaded bags into her SUV, and took the crunchy remains of summer to the recycling location. Two single women, one holding the bag, one scooping the leaves. Dana always had a film of dirt that covered her straight, white teeth when she did yard work. We filled roughly 25 bags per yard, which meant one or two full days of talking about the Polish man she set me up with who had a boisterous voice and was angry that my dog stayed away from him; the disagreement Dana had with her oldest sister for giving her niece some advice; the book we were reading for book club; and anything else that came up. We also talked about moving out of the city. I wanted to be close to the mountains; Dana wanted to be out in the country, maybe in an old farmhouse. We helped each other whenever we needed to. I gave her rides when her car broke down; she helped me lift out my patio umbrella when it was time to take it in for the winter. A closeness of reliability established. We were also the same age, 38. Relationships and family and eating organic foods and using dog-friendly fertilizers on our lawns. Conversations that held us together and gave us a strength in having closeness right next door. We sat on our front porches and drank micro brewed beer, and watched the cars speed down our street, the elderly people from the retirement high rise explore the neighborhood with the help of walkers and canes, and sometimes, late at night, the coyotes or foxes trot beneath the streetlights, as if they had not yet realized they were out of place. Dana and I hated Fourth of July celebrations. The noise scared our dogs, and our neighborhood transformed into somewhat of a war zone. Constant blasts and screeching and combustions. Illegal fireworks shot from every direction, landing on house roofs, hitting cars, and polluting the air well past midnight. One Fourth of July, Dana turned down the street that led to our alley. Several families had their fireworks set up in a long line down the middle of the street. As the people waved Dana to slow down, she pretended to ignore them, and drove over all of the mini explosives, leaving them as flat in-ignitable trash. They swore at her and raised their fists, but she just kept driving into our alley, into her garage. I laughed when she told me this, and I wished I had seen it. Dana was my friend, but more and more, I was beginning to feel the element of control in her personality. She wanted me to shop at Whole Foods even though at that time I could not afford to, she wanted me to eat only whole grains, and she wanted me to buy only farmer's market vegetables. She insisted that Finbar eat the brand of dog food Betty ate, and that I give Finbar raw hide. I explained that Finbar had crystals and had to be on special food, and that my vet advised me to avoid raw hide because it destroyed dogs' stomachs, but Dana would not let up. She even told me that I was using the incorrect word to coax my dog into delicate behavior when needed. I used "easy" and Dana used "gentle." Once in a while, in the summers she mowed my front lawn or in the winters, shoveled the snow from my walk. At first I thought she was helping me out because of my busy schedule. Then I realized she did not like my grass to be too long, or the snow to build up sloppily on my sidewalk. She talked of manicured lawns and neat yards. Each year during the weeks leading up to Thanksgiving she pestered me about volunteering at the Denver shelter to dish out food to the homeless. She knew my father had been an alcoholic transient for roughly ten years. Again and again, I explained to Dana that I did not feel comfortable working with homeless people, yet she continued to press me. I pulled out of my garage one day and passed Dana in the ally. "I'm going to see a movie with my mom." She gave my car a quick glance. "You need to wash your car." I laughed. "Yeah, it's pretty dirty." I drove away and thought of how Dana was similar to my grandmother. My grandma knows no other way to communicate to people other than in a directional manner. All of our lives, my sisters and I were under the tough watch of my grandma-she yelled at us to clean the house the right way, to lose weight or wear less makeup, to lay the plates down correctly on the table. And now Dana was telling me to mow my lawn, shovel my walk, and wash my car. I was beginning to resent her, but at the same time, wanting to keep our friendship because of the bond we had formed, our similar interests, and the simple bits of laughter we shared. I went out of town and hired a friend of Dana's to watch Finbar. Beforehand, I asked Sara if she was okay with an 80-pound dog sleeping on the bed. She told me all of their dogs slept on the bed. So when I came home from vacation and discovered that Sara had told Dana she did not want Finbar on the bed and Dana told her it was okay to make my dog sleep on the floor, I was angry. Dana had many times expressed her disapproval of Finbar sleeping on my bed, and I felt that she took this opportunity to teach me a lesson. I also found out that while I was out of town, Dana came over and did all of her laundry at my house while she hung out with Sara. My grandparents had stopped by to see how things were going and they saw the piles of clothes and Dana loading the washing machine and dryer. I began to pull away from Dana. I stopped asking her to go to book readings, to dinner, and to silly classes at Colorado Free University like historical walking tours of Denver . Dana desperately wanted to have children. Any time one of her friends needed a babysitter, Dana was there. Babies in public, Dana cooed and gooed her excitement. When she was married to Casey, he was not ready, so they never tried. She met Shane at work. She had originally set me up with Shane, but on our blind date, it was apparent that my confidence and his insecurity would not mesh. Several months later, Dana pursued him. He eventually moved in with her and I was happy for her. He helped her landscape her yard, paint her house, design her new kitchen. At one point, my house became infested with mice. I had been catching them one by one in a humane trap, and then driving them to the lake where I would release them. But they were multiplying at their mouse-multiplying rate, and I could not keep up. Knowing that I would have a difficult time killing mice, Dana brought Shane over to my house where they told me of their plan to lay traps, insisting it was the cruelty-free way to kill mice versus poison that slowly eats away their insides until they die. They explained that they would check the traps when I wasn't home so I wouldn't have to face the grim deed. After cleaning away hundreds of tiny black turds from my closets, my floors, my pantry, and even my oven, I agreed to it. Dana and Shane successfully took care of my mouse-problem, and I, with weakness pitted against practicality, never had to see the dead mice. Dana and Shane were together for about a year. He was quiet and shy, and on summer nights, I could hear her through the windows dispensing orders and correcting his actions. He was not wiping down the countertops correctly, he was not putting the rocks down in the yard in the right place, he was not loading the dishwasher in the right way. I wanted her to stop trying to control him; I wanted her to wrap herself around him and be close, to laugh with him. I did not want her to push him away. Shane periodically went out to happy hour with friends from work. On a Friday night, Shane drank too much, drove home, and when the traffic light turned yellow, he tried to run it. The car in front of him did not. Shane sent the little girl in the car to the hospital where she lay unconscious for two weeks, and then died. Shane went to prison. Dana and I took many walks around the lake during that time. She cried, but always looked pretty in her Dana-natural way. Little make-up, only light brown eye pencil surrounding her faint green eyes, no mascara, and no face make-up or blush. Simple, natural prettiness to match her simple, light brown hair cut in a pixie. She wanted to marry Shane. While Finbar ran on her tall graceful legs like a horse, and Betty moved over the large boulders by the lake like a true athlete, Dana told me how she went to see Shane several times a week. "I keep telling him that we need to make plans, that we need to get married and start having kids." I listened to her recount conversations with him, knowing that she was in a delicate place, an emotional gate cutting her off from grasping Shane's current existence. Responses in such situations take much analyzing. I am direct. But I knew that Dana could not handle directness in this. So I did not say a word. I listened for weeks as Dana continued to tell me of her pressing Shane into marriage. Finally, one night on the phone, I said, "Dana, I know that you love Shane, and he loves you. But think about what he must be going through right now." Alisa A. Gaston-Linn's work has appeared in The Sun, HipInk, is forthcoming in Hawaii Pacific Review, and one of her feature-length screenplays won first place in the Telluride Indiefest Scriptwriting Competition. She earned a master's in Liberal Studies with Advanced Study in Creative Writing from the University of Denver, is a professional web writer and editor, and teaches writing to youth. She has traveled around Europe, South America (including the Galapagos Islands), Canada, Australia, and New Zealand, and worked three austral summer seasons in Antarctica. Alisa lives in Colorado with her husband, daughter, and two Weimaraners. She is currently working on a novel.